On Sept. 2nd, a billion-ton coronal mass ejection (CME) slammed into Earth’s magnetic field. Campers in the Rocky Mountains woke up in the middle of the night, thinking that the glow they saw was sunrise. No, it was the Northern Lights. People in Cuba read their morning paper by the red illumination of aurora borealis. Earth was peppered by particles so energetic, they altered the chemistry of polar ice. Hard to believe? It really happened–exactly 156 years ago. 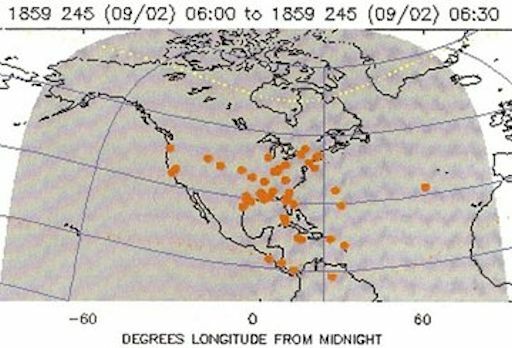 This map shows where auroras were sighted in the early hours of Sept. 2, 1859. The cause of all this was an extraordinary solar flare witnessed the day before by British astronomer Richard Carrington. His sighting marked the discovery of solar flares and foreshadowed a new field of study: space weather. According to the National Academy of Sciences, if a similar storm occurred today, it would cause a trillion dollars in damage to society’s high-tech infrastructure and require four to ten years for complete recovery. In fact, a similar flare did occur just a few years ago. On July 23, 2012, a CME of rare power rocketed away from the sun. The storm was in all respects at least as strong as the 1859 Carrington event. The only difference is, it missed. no harm was done. The July 2012 event serves as a reminder, however, that extreme space weather is not a thing of the past. Picture this: A billion-ton coronal mass ejection (CME) slams into Earth's magnetic field. Campers in the Rocky Mountains wake up in the middle of the night, thinking that the glow they see is sunrise. No, it's the Northern Lights. People in Cuba read their morning paper by the red illumination of aurora borealis. Earth is peppered by particles so energetic, they alter the chemistry of polar ice. The cause of all this was an extraordinary solar flare witnessed the day before by British astronomer Richard Carrington. His sighting on Sept. 1, 1859, marked the discovery of solar flares and foreshadowed a new field of study: space weather. According to a NASA-funded study by the National Academy of Sciences, if a similar "Carrington Event" occurred today, it could cause substantial damage to society's high-tech infrastructure and require years for complete recovery. Could it happen again? Almost certainly. In a paper published just a few months ago, researchers from the University of Birmingham used Extreme Value Theory to estimate the average time between "Carrington-like flares." Their best answer: ~100 years. In other words, we may be overdue for a really big storm. Read their original research here.